Exhibit Transport LLC, Huntington Beach, Chicago, New York, and UK has tested Battery Equaliser in all their electric forklifts with great results. Exhibit Transport LLC is a trade show shipping company that specializes in international trade show shipping. Their warehouses each have an electric forklift to handle freight. 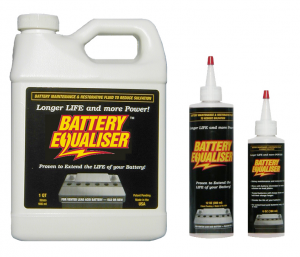 In October of 2010 they had contacted us here are Battery Equaliser to get a preventative maintenance additive for their forklift’s lead acid batteries. It was not long after the first application that their operations supervisor (Trevor Page) called and told us that all of their forklifts where running much longer and took considerably less time to charge. Trevor has approved the product to be used in their UK warehouse with the comment “without a doubt the easiest way I have saved money”. It is Trevors estimate that the energy savings from reduced charge time has paid off the cost of the product within 3 months. Trevor went on to explain that he had been budgeting to replace the batteries within the year and is now confident that he will be able to defer that cost for at least 2 more years. Battery Equaliser is proud to be such a unique and useful product and always appreciates it when we hear about success stories like this.